"The curveball is coming back," declared outfielder Chris Coghlan, then with the A's, in a locker room chat three weeks into the 2016 season. At the time, it was difficult to see much in the data that reflected truth to that opinion, but when a former Rookie of the Year Award winner coming off two consecutive above-average seasons tells you he sees something on the field, you remember it. Seven months later, it's clear Coghlan knew what he was talking about. We saw thousands more curveballs in 2016, particularly in the playoffs, and especially to attack the Cubs. Of those curveballs, a huge amount contained much higher spin, which we've now been able to measure with Statcast™ for two seasons. So what's going on? Why the change? And can we use these trends to identify the pitchers who might be worth experimenting with as the next Hill? Let's start with the data and the caveat that we'll be combining both regular curves and knuckle-curves into one category here. During the 2016 regular season, 10.9 percent of pitches were counted as curveballs, up from 2015's 9.9 percent and nearly two points above 2010's low of 9 percent. If a point or two doesn't sound like much, realize that baseball threw more than 700,000 pitches this year, so each point represents about 7,000 pitches. In raw terms, the jump from 69,710 curves in 2015 to 77,442 in 2016 meant 7,732 additional curves. That's a lot of additional breaking pitches. Unsurprisingly, we're seeing plenty of pitchers focus more heavily on the curve, too. If we look back to 2008, there have been 1,283 pitcher seasons of at least 100 innings. Three of the top four individual curveballing seasons took place this past year, and all four were over the last two seasons. While it's too soon to say this is a long-term trend, it's definitely a change that's become noticeable. For example, in 2015, first pitches of plate appearances were curves 10.2 percent of the time (18,765 pitches). In 2016, that was 11.5 percent (21,210 pitches). Curves are becoming acceptable on all counts. But while simply seeing more curves is interesting, it's the types of curves we're seeing that perhaps tell a greater story. Looking at Statcast™ data, the average spin rate on a curveball in 2015 was 2,302 rpm. In 2016, that jumped to 2,462 rpm. Let's (somewhat arbitrarily) set the line for a high-spin curve at 2,600 rpm. In 2015, 23.5 percent of curves were above that, which makes for a nice divider of "the top one-quarter of curveball spin rates." In 2016, that jumped to 30.5 percent of curves, meaning nearly a third of curves were spinning that high. Teams surely know that, and there's some evidence that they are now selecting pitchers for spin. Famously, we know that the Astros grabbed Collin McHugh because they liked his curveball spin. 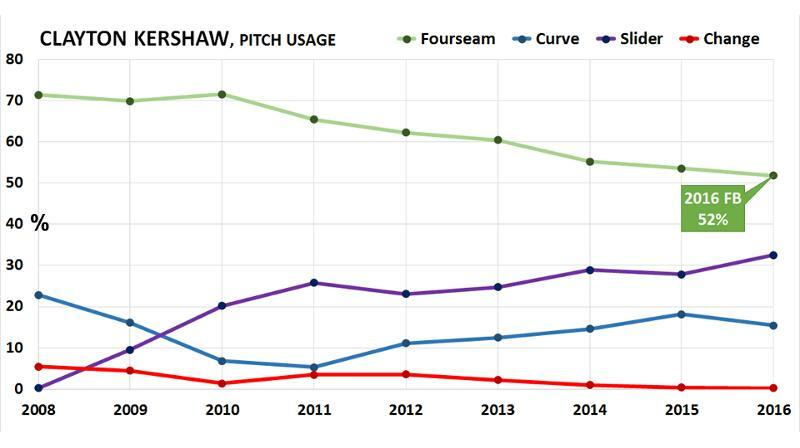 We know the Padres asked Pomeranz to throw his curve more, leading to his best season, and we know Clayton Kershaw has been decreasing his fastball usage to throw more curves and sliders for years. Montgomery added nearly 100 rpm on his curve this year, and he started using it more often on the advice of pitching coach Chris Bosio after he was traded to the Cubs in July. It doesn't take much to see what Bosio saw; in parts of two seasons, Montgomery's curve has produced a .103/.198/.150 line. His primary fastball has been a lot less successful, with a .289/.357/.474 line against. After throwing the curve 12 percent of the time in 2015, Montgomery's hook came out 29 percent of the time with the Cubs. "Take your best pitch and throw it more" is basically what both Hill and Pomeranz said, and that applies here very well. Fiers has very good curveball spin (2,669 rpm), but he gets elite curveball movement (11.3 inches, most in the Majors), which suggests he may get the most useful spin of anyone. It's been effective, too, with a career .203 average against and 30.1 percent whiffs-per-swing rate, both the best of his pitches. But Fiers has only thrown it around 15 to 20 percent of the time, preferring to focus on his four-seam and cut fastballs, and he's been inconsistent at best, with a career 3.87 ERA. The four-seam, which averages 90 mph, particularly ranks poorly. Fiers is on the right team to push the curve envelope, and we may have seen the beginnings of it last season. Over the first four months, he threw his curve 15.7 percent of the time. In August and September? That went up to 25.3. It's a start. In one important way, Ventura is the polar opposite of Hill, and that's that he throws heat, so a righty who averages 96.2 mph on his fastball will never be "like Rich Hill." But despite the velocity, Ventura's fastballs just aren't that effective. On his four-seamer, hitters hit .343 with a .613 slugging this year. Ventura's two-seamer gets more grounders, yet had .313/.417 marks. Even with elite heat and Kansas City's great defense, he's got a 4.28 ERA and 4.11 FIP the last two seasons. The curveball, however, plays. Ventura's 2,625 rpm spin rate this year was above average, and the career line against (.168/.194/.262, 15.9 swinging strike rate) is outstanding. He did throw it 25 percent of the time last year. Would more help? You knew we had to include baseball's reigning spin king, right? Lugo's 3,498 rpm curve to whiff Xavier Scruggs in August was the highest-spin curve on record, and he's got 43 of the top 50 curve spins tracked in 2016. In terms of movement, his 11.1 inches was second only to Fiers, but he also threw it just 16 percent of the time. While Lugo's debut season was a nice surprise, his 2.67 ERA was not supported by a .230 BABIP or 4.33 FIP -- suggesting that he won't see the same results next year by doing the same thing. How about using more of one of baseball's off-the-charts pitches?